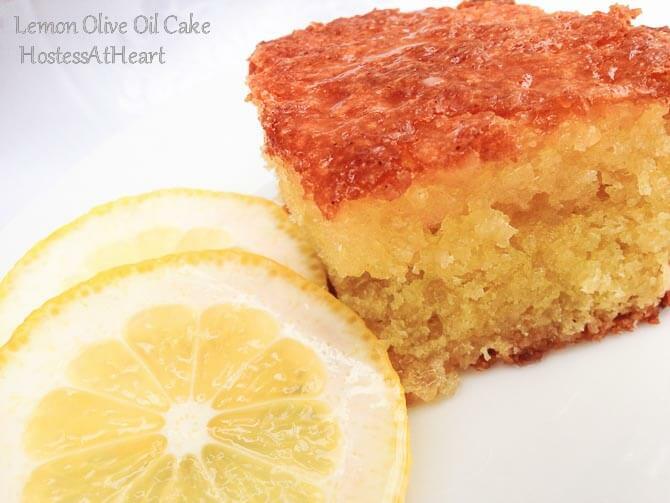 The color of this Lemon Olive Oil Lemon Cake is gorgeous, the smell is amazing, and best of all, it’s easy to put together. It tastes like summer all year long. Lemons are one of those gifts that we have in the winter time that remind us that not everything is blah and colorless! One whiff of lemon and I feel renewed! 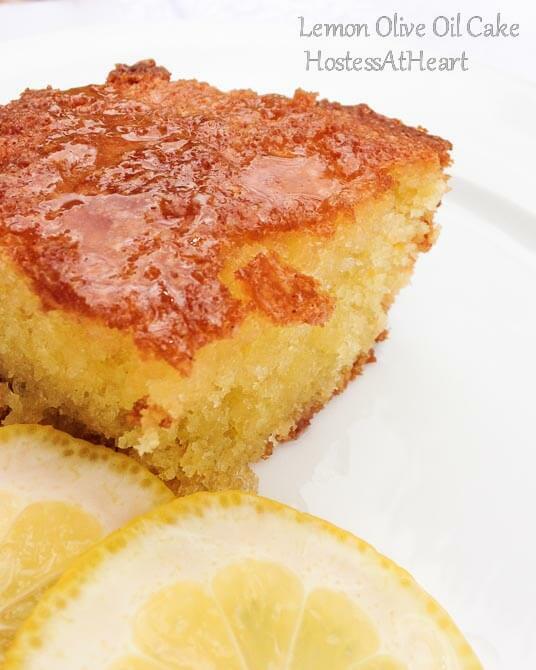 One taste of Olive Oil Lemon Cake and it takes me back to summer and sunshine. I have had a life-long love affair with lemons. They are so versatile and there are many uses for them. Household and Cleaning – Clean and disinfect cutting boards and other wooden tools, deodorize plastic containers, and polish stainless steel to name a few. Beauty and Health – Works as a deodorant, replaces bleach in the washer, removes mildew, soothes sore throats and sanitizes jewelry. Food and Drink – Wash produce, refresh aging lettuce, preserve fruit and veggies, and lower salt intake. Pets, garden and more – spraying surface acts as a repellent to cats, naturally kills weeds, deodorizes humidifiers, and repels ants and other pests. My favorite is the food and beverage uses. Go figure! I love slicing a lemon into a pitcher of water. I also love cooking and baking with lemon. Chicken and lemon is a marriage made in heaven. And then….drum roll pounding on counter….desserts. puddings, cakes, pies, muffins. Oh stop already I know you get the point. I love lemon. I couldn’t stop thinking about this cake. It was so fresh and delicious. I went back a couple days later and bought the olive oil. I waited two whole days. No obsessive compulsive behaviors here. I put this wonderful cake together and knew I had to share it. 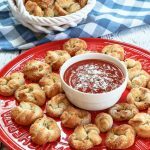 I have seen some other recipes baked with olive oil lately, and I won’t be afraid to try them. I hope you will not be afraid to try this cake. It has a great lemon flavor and is tender and not overly sweet. The color is gorgeous, the smell was amazing, and best of all, it’s not difficult to put together. The color of this Lemon Olive Oil Lemon Cake is gorgeous, the smell is amazing, and best of all, it's easy to put together. Preheat oven to 325 degrees F. Spray a 9x13 cake pan or a 8 cup bundt pan with nonstick baking spray with flour. In a large bowl, combine cake ingredients and beat until combined. Pour batter into prepared pan and bake for 35 to 50 minutes until dark and golden brown. While cake is in the oven, combine glaze ingredients. Whisk to blend. Remove cake from oven. Whisk glaze mixture again, and carefully spoon 1/2 of the glaze over the cake. Loosen the edges of the cake and turn out onto a serving plate. Slowly drizzle remaining glaze over cake. Allow to cool. You can find me on Facebook, Twitter, Pinterest, Instagram and Google +. I would love it if you would follow me so we can keep in touch. Delicious! I have made a similar cake using grated carrots and I couldn’t believe how light and moist it was! Carrots? Very interesting. I love seeing and hearing all the interesting people do. So good to hear from you again! Thank you! I did enjoy this cake. I haven’t looked at the baking book. I’ll have to look for it. Yum! This cake looks so lemony and moist–sounds delicious! Thank you Nancy. It is so light and delicious! I remember you said how much you love lemons! Your love for lemons is clearly showing here. What a fantastic recipe. Thank you Dave! Your memory is perfect! Thank you! Do give it a try. I think you will enjoy it. Enjoy your day! It looks so moist, you made it perfect, Julie! 🙂 I made similar cakes couple of times, but sometimes it was too oily… yours looks good! I’ve seen cakes and such made with olive oil but never made or tried one, gonna have to try this it looks amazing! Love lemon in cakes, it tastes so wonderful and is perfect with spring right around the corner. Thank you! Spring better be around the corner!! Ha! I have gadgets and pans in three different rooms! lol. me too! Does the garage count for some things – make that four! hmmmm garage…a new hiding place :)! Well, I keep my giant roaster and my canning stuff out there…both are kind of once a year things, if that. I had to do everything to resist licking my screen! I love Lemon too! I love just drinking Lemon and water everyday! in a cake? Even more!! 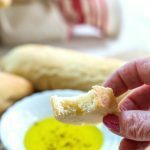 I’ve never baked with Olive oil… but now I’m convinced that I have to try! 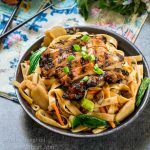 Thank you for sharing this recipe Julie! Thank you for stopping by and your lovely comments! Thank you! I just love lemons in so many things! I would never think to make a cake with olive oil, but I bet it makes it SO moist! I wouldn’t have either and couldn’t believe how fresh and light it tasted. Thanks for stopping! This just screams sunshine, summer, windows down, music blaring, and me EATING! hahahaa… it looks so delcious, I need a little sliver! Thanks Stephanie! It’s Friday let’s have a big piece! I’ve always wanted to try an Olive Oil Cake! I didn’t know much about them and probably wouldn’t have except for that darned little sample that changed my mind. 🙂 Thanks Sarah. Thank you Jhuls and thank you for hosting this weeks FF! I’ll be taking this cake. Thank you Ana! It is so bright that it just makes me happy. Thank you Loretta! 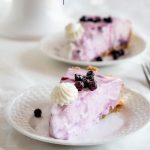 I often bake on the weekend and will enjoy a piece after dinner and then either leave the rest for my hubby who is a gym rat and works off the sweets, or share them with my neighbors. That makes it a bit easier on the figure. I have been on a lemon kick lately. This cake looks deliciously moist, and I love the fact that it is not too sweet. Exactly Thao! So glad that you visited and commented! I know what you mean! I have been too! I am totally with ya on the lemony things! This cake has to be just as moist as it looks. Yum! It was so moist and the crumb is light and delicious! Thanks Debbie! Wonderful looking and sounding cake. I’ve used olive oil in a polenta cake before, it sounds like it would be lovely here as well. Great pictures, that glaze makes it. Ohhh polenta cake? That sounds amazing. Is it on your blog? I love citrus flavored desserts or even savory dishes for that matter. They bring a nice “warmth” (Spring) to a recipe! Mmm, looks delicious Julie! You waited 2 whole days? Lol, let’s see if I can…I have a few Meyer lemons begging to be used. Absolutely gorgeous, Julie 🙂 Olive oil and lemon sounds a great combination for me! Thank you! It was so nice and bright. Have a great day. This is Caveman John checking in and I disagree with this post. I would also serve some good bread along with beer and/or wine! I stand corrected caveman John you have been an amazing wine sommelier and paired our meals amazingly well. Thank you Petra. Don’t you live where lemons are plentiful? Thank you so much Malar! Have a lovely day! This cake is absolutely delightful! First, I thought just like you…What? Olive oil in cake? After reading the entire post I have an irresistible urge to try it! Thank you so much! It was a new idea for me too and I couldn’t believe how delicious it was. Oooooh Julie! That looks so amazing 🙂 I can see how moist it is… pinning! Thank you Amanda! It was pretty darned delicious! I love that youre being optimistic about the fresh produce drought we go through in the wintertime. I’m so bummed out over it….where did my farmers markets go?! I’d love for you to share a post over at my link up today, if you’re interested. I know what you mean! Thank you for the invitation! Yum! This looks delicious! I love Sur La Table. I have to limit how often I go there because I always want to walk out with everything. That is for sure! I walk in there and it’s like cheers! Looks soo tempting! I wish i got a piece to taste. Thank you! Mine is gone too! Time to make another one. I’ve made one of these similar citrus-olive oil cakes before, but yours looks deiciously sticky, and I really like that! I love using infused olive oils, too, and one could be also used in a cake like this. But there’s nothing quite like good olive oil that really tastes like olives! YOu are definitely not an impulsive shopper! Ha! I have a split personality half frugal and half impulsive. I fight with myself all the time! That is a great idea to use infused oils…hmmm. It is really easy skd and very moist. I hope you like it. Thanks for stopping by! 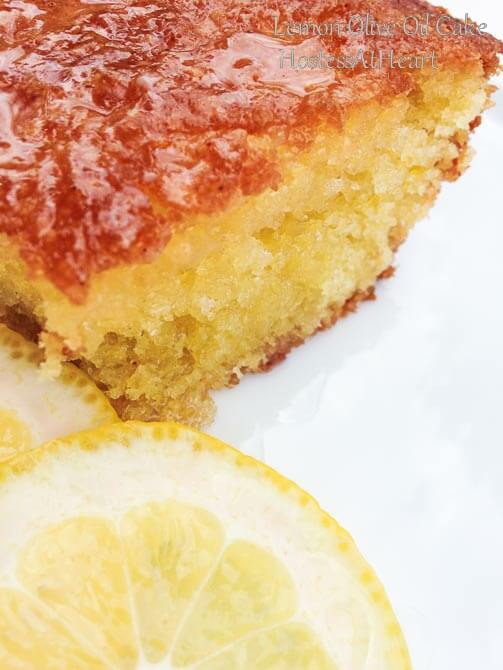 Love this cake Julie, anything citrus is a favorite of mine and this molst cake is a must try. I agree whole heartedly! It is like spring year around. Have a great day!